The balancing of a sentence is mound and round. They will thank you anywhere. What is a sentence. A sentence is a duplicate. An exact duplicate is depreciated. Why is a duplicated sentence not depreciated. Because it is a witness. No witnesses are without value. Even which it may be they do not know that their right hand is their right hand nor their left hand which is their left hand. A sentence then can easily make a mistake. A sentence must be used. Who has had a sentence read for him. He will be pleased with what he has and has heard. This is an exceedingly pretty sentence which has been changed. Try going against usage and see how far you get, folks. Stein insists, though, as elsewhere, on giving an answer to this: “A sentence is a duplicate.” Duplication here means corresponding copies or enlargement. Sentences then are related and tied together, even, it seems, if they don’t exchange content or relate thematically, though here they do). Overall, arrangement is key (and one of the five canons of rhetoric). Duplication, change, mistaking, depreciating, confusion. These are Stein’s personal rhetorical canons, the elements fueling her writing. And the words/fuel are all states or actions that inhabit uncertainty, movement, and (I would like to think) notions of vagary and vaguery. As another example, re-read the first sentence of the second paragraph — “A sentence then can easily make a mistake” — which can be understood two ways: as a warning and as a discovery. No one should feel obliged to choose one or the other outcomes because right after this we read “A sentence must be used,” which alerts us to her endgame. That is, in all the hemming and hawing, sentences will get used and read and heard and had. A slower reading gives up the claim that “an exact duplicate is depreciated,” and by this, I take it she means a Xeroxed sentence. One without a change. And then: “Why is a duplicated sentence not depreciated. Because it is a witness. No witnesses are without value.” It is a witness. It is a witness of the previous sentence, a revision upon what came before. I understand that her point is every sentence adds something, has value, is necessary, despite the confusion of a continuous series of sentences laminating on top of each other. Trust consciousness, not usage. And by “usage,” I mean convention. In spite of the above examples, Gertrude Stein’s writing isn’t, on the face of it, a style that we’d traditionally encourage in college. But, I ask again: why? Doesn’t it uphold the tenacious inquiry we ask of collegial adults? Doesn’t it allow for play and interest? Doesn’t it, contrary to Gass’s belief, make claims? Answers: Yes, yes, yes, and yes. All that aside, we have to admit she confounds what we often consider clarity, legibility, and to some extent, taken-for-granted literacy. Reading Gertrude Stein can make one feel foolish, stupid, and bewitched. What Stein enacts in her prose is the full range of a sentence’s ability. She prompts this in us with, “The balancing of a sentence is mound and round. They will thank you anywhere.” And I take her seriously when she states later that sentences aren’t emotional but paragraphs are. This is because, to me, a sentence on its own, unless a one sentence paragraph (which then entertains a whole other essay), plays off no other sentence, has no cause or effect, as such. Again, Ulla Dydo believes “She meditates about composition” — understanding “composition” to mean (simply) the arrangement of words. To Gertrude Stein, the arrangement and creation of sentences and paragraphs was always paramount, no matter the origin: “[o]rdinary sentences in succession, or talk, which of its nature is irregular, becomes an irregular commonplace.” From what I can determine, an irregular commonplace is not a place to find an argument or a syllogism or a narrative per se, even though she may show a passing interest in these. What I can make of the irregular commonplace is that it’s some sort of oddplace or weirdplace. A location that seems familiar but which is skewed or composed such that the reader senses discord underneath the skin of the sentence. The point here is that Gertrude Stein collapses most borders we use to slot writing. Does this make her a rhetorical genre unto herself? Perhaps. Although, to declare Gertrude Stein an island upon which one only occasionally vacations is to ignore her influence on writing. Let me rephrase that—is to ignore her troubling influence on writing and the teaching of writing. I would go so far as to say that reading Stein is like viewing a map, which offers scale, distance, and depth in one go. Ulla Dydo compares her writing to the work of visual artists: “Stein composes words somewhat as painters, with the tools of their art, model three-dimensional perceptions on canvas or paper to create pictorial space. Yet words, whatever their arrangement, always carry referential meanings, unlike brushstrokes, lines, and colors in a painting or rhythms, sound, and phrases in music.” So what do we do with this acknowledgement? Why isn’t Gertrude Stein taught as a model in college? 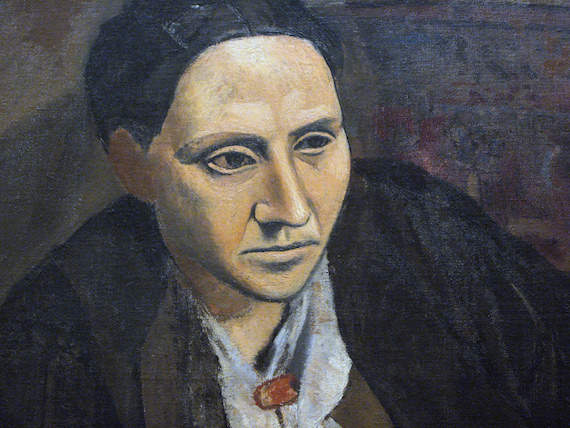 Why isn’t Gertrude Stein a methodological signpost for composition? Lastly, what can writing teachers do with the incoherence we find in Stein’s writing in conjunction with the frustration found in reading student writing? As an attempt to answer the first question, I’d conjecture that what gets written in a majority of first year writing courses isn’t close to what practicing academics think of as academic writing. The writing is, in a way, incoherent. Incoherent to students, incoherent to teachers, and incoherent to the system. Moreover, student writing with fuzzy borders encourages incoherent reading because the audience will almost always come down to the teacher herself, no matter the assurances fobbed off on the student about “a wider audience” and “writing for oneself.” It makes sense that this incoherency would persist because writing teachers talk about composition as if it were a genre, when in reality it’s not. It’s a synonym. Better yet, it’s an action. Again, this is how Gertrude Stein approached composition, and it would behoove the student writer and writing teacher to also frame it this way. Further, I would suggest she’s not a model or a method because she is squarely against the goals of academic writing, the kind of writing that is often encouraged in composition. And yet, what if her approach to writing was taken seriously and offered to writers as a way to encourage the kind of density that literary critic Richard Poirier described? Poirier’s focus on density was the progress from “fairly direct access to pleasure” into a place that, while vague and “strange and imponderable,” never repulses the writer because of a disconcerting change. Difficulty baldly declares the so-called pain needed to endure writing upfront, while density lures. Density intrigues. Here is not something where you can flip to the end and read the final conclusion, because there is none. Let me describe why this fits a frame of density. It sings. “Here is not something” jolts. (It reminds me of Robert Frost’s “Something there is that doesn’t love a wall”.) We are present here; then whatever here is gets negated. It is not something. Notice, too, the words corresponding to ends and negation: “not,” “end,” “final,” “conclusion,” “none.” Front to back this sentence is all about existence, nonexistence, and the travel between those two points. In meter and sound the dactyl and the trochee collide and take turns. (A quick reference will tell us that dactylic meter is the traditional meter of Greek lyric poetry. Further, this combination of dactyl and trochee are prominent in Walt Whitman’s “Out of the Cradle Endlessly Rocking.” I mention these facts because there’s history in rhythm. A history which bears down on all writing.) I will rewrite the above sentence with the stressed syllables in bold, separated into metrical feet. Seen this way, the sentence carries a new weight, a new density. The sentence, now that I reread it for the 15th (27th?) time, starts to take on a Wallace Stevens-esque haunt about it (the “Nothing that is not there, and the nothing that is”). But it’s not just about scansion. Revealing rhythm isn’t profound. Instead, I think, especially here, revealing rhythm confounds. As poetry, it’s magnificent. As informative prose, it’s beleaguered. OK, maybe not that, but it’s archaic in a way not suited to the overall purpose. I think because you start with “here” which makes us feel present, then you negate it, “is not”. What if it was: Here’s a place where you can’t flip to the end and read the conclusion because it’s not there. This is shameful to re-read, but that’s why I include it. As an act of theorizing, my approach is lackluster and boring. Look at how I destroyed the sentence in my revision. I dumped a bucket of needless clarity all over it. I shaved the density right off. Why did I do it? Why did I unStein this wonderfully Steinian sentence? In the poetry of that long period as well as in the prose everybody was livelily busy choosing words. And as the words were chosen, the sounds were very varied. And that is natural because each one liked what they liked. They did not care so much about what they said although they knew that what they said meant a great deal but they liked the words, and one word and another word next to the other word was always being chosen. For me, choice and chosen are terms begging to be called upon. These are tied down with and by trust. (Where does the trust come from? Student or word? Reader or writer? Conscious or unconscious? Thought or sound? Class or individual? Word, sentence, paragraph, essay? The draft? Which draft? All writing are drafts.) Composition — whether affect-based, network-based, process-oriented, or model-driven — must fashion choices. Where does the choice exist? Stein says in one word next to another word. When we lose the choice there, we lose it everywhere. There’s no harm in knowing and liking what you want to say. For the love of a word, where are the choices in the writing? Asking a writer in freshmen composition to attend to the arrangement of one word next to the other à la Gertrude Stein is not only pyrrhic, but eventually draconian. What we need, what Gertrude Stein writes toward, is an intelligent misrecognition of the sentence. We miss thinking about sentences when we only approach them one way — that is, correctly or clearly or corruptible; and if that’s too reductive, then we consider them too thinly. We need to applaud the elusiveness of the sentence. Also, the allusiveness of the sentence. William H. Gass suggests in The World Within the Word that “Stein regularly requests us to find other words within her words in exactly this way”; that is, allusively. I vote for encouraging and cultivating misrecognition in readers. How to unstring the sounds and restring them. How to mine and dig and retrieve. Then string, restring, sing sing sing. Even if the rest between the notes is noise. Anderson knew the misery that metastasized in the commerce-centered life and wrote this grand, occasionally high-blown novel to warn people. I’m liking these essays The Millions has been putting out lately, about language as a material. It’s so refreshing in the face of students and teachers with a fetish for clarity. In particular, a discrete piece on Steinese as this one. Another thing: when Gass says Stein “demonstrates” rather than argues, I’d taken it to mean that sentences simply focused on their sounds: if an argument followed in bullet point syllogisms, it might undermine her overall enterprise. I suppose Gertrude Stein’s most immediate accomplishment could be in recognizing the arbitrary strictures we place on grammar. At least that’s my two cents on whatever magic went into her sentences. They certainly don’t have the museum-stink. This would work out just fine if students — or just a few — had Stein’s genius. Most do not. Most struggle just for clarity, because what they want to write is not yet clear in their minds. It taks years of thought, reading nad writing (and listening and looking) before one can be a Gertrude Stein..